— Republicans have better than 50-50 odds to hold control of the U.S. Senate even in the event of a Democratic wave in November. — The reason is the map: Including the two independents who caucus with them, the Democrats are defending 26 of the 34 seats being contested this fall, which is the most lopsided Senate map any party has faced in a midterm since 1938. Five of the Democratic seats are in states that Donald Trump won in landslides, and another five are in states he won. — Because the map is so good for Republicans, it is possible they will add to their majority even if the electoral environment otherwise breaks against them in other elections, such as those for the U.S. House of Representatives. — That said, the Democrats do have a path to a Senate majority, albeit slim. 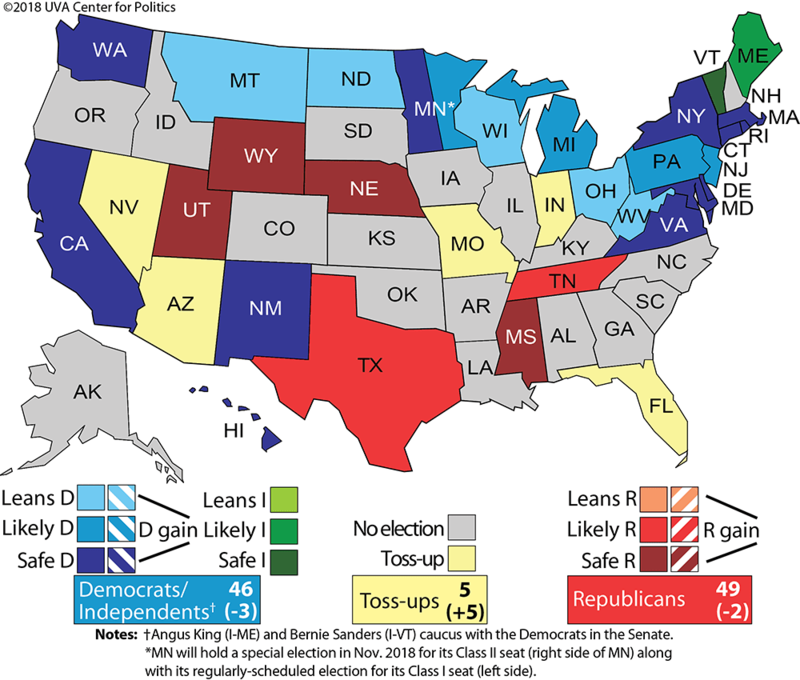 — Our current outlook is for a continuing Republican majority but little net change in what is already a closely divided Senate. — We have two ratings changes this week, both upgrades for Democrats. Appointed Sen. Tina Smith (D-MN) moves from Leans Democratic to Likely Democratic as she seeks election to the remainder of former Sen. Al Franken’s (D-MN) term, and Sen. Tim Kaine (D-VA) moves from Likely Democratic to Safe Democratic. Map 1 shows our current state-by-state ratings. The victory by Sen. Doug Jones (D-AL) in a special election in December did provide Democrats a potential path to a Senate majority, albeit a narrow one. The Democrats need to defend all 26 of the 34 seats they currently hold, and then flip two of the eight Republican-held seats. Those would most likely be Arizona, an open seat, and Nevada, where Sen. Dean Heller (R) is seeking a second term. We know that the presidential party usually suffers in midterms, especially if the president is unpopular. While President Trump’s approval rating has rebounded slightly in recent weeks, moving from an average in the high 30s to one that’s now in the low 40s, his overall numbers are still weak and could just as easily fall back as the year moves on. The midterm reelection rate for non-presidential party Senate incumbents is 91% in the era of popular elections (since 1913), while it’s just 75% for presidential party incumbents. Democrats are fortunate that they have incumbents running in all 26 seats, although Sen. Tina Smith (D-MN) is an appointee. But it’s hard to overstate how Republican this year’s Senate playing field is.